Wing Span: 3/4 - 7/8 inches (1.9 - 2.3 cm). Flight: One flight; Mid-March to June. Caterpillar Hosts: Low Eriogonum species, E. pusillum and E. reniforme. 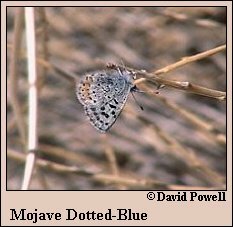 Habitat: Desert washes and sandy areas. Range: Mojave Desert region of southeastern California, southern Nevada, southeastern Utah, and northwestern Arizona. A small isolated population in northern Baja California. Conservation: Lives in a fragile habitat, increasingly being invaded by fire-susceptible cheatgrass. NCGR: G2,G3 - for species imperiled because of rarity (6 to 20 occurrences), or because of other factors demonstrably making it very vulnerable to extinction throughout its range. (Endangered throughout its range). OR very rare or local throughout its range or found locally in a restricted range . Subspecies virginiensis Austin is of more dire conservation concern. Management Needs: Conserve all habitats and maintain host plant populations for this species.